English Home Life in the Reign of James I.—Sir Henry Wootton quoted—Inigo Jones and his work—Ford Castle—Chimney Pieces in South Kensington Museum—Table in the Carpenters' Hall—Hall of the Barbers' Company—The Charterhouse—Time of Charles I.—Furniture at Knole—Eagle House, Wimbledon, Mr. Charles Eastlake— Monuments at Canterbury and Westminster—Settles, Couches, and Chairs of the Stuart period—Sir Paul Pindar's House—Cromwellian Furniture—The Restoration— Indo-Portuguese Furniture—Hampton Court Palace—Evelyn's description—The Great Fire of London—Hall of the Brewers' Company—Oak Panelling of the time—Grinling Gibbons and his work—The Edict of Nantes—Silver Furniture at Knole—William III. and Dutch influence—Queen Anne—Sideboards, Bureaus, and Grandfather's Clocks—Furniture at Hampton Court. n the chapter on "Renaissance" the great Art revival in England has been noticed; in the Elizabethan oak work of chimney pieces, panelling, and furniture, are to be found varying forms of the free classic style which the Renaissance had brought about. These fluctuating changes in fashion continued in England from the time of Elizabeth until the middle of the eighteenth century, when, as will be shewn presently, a distinct alteration in the design of furniture took place. The domestic habits of Englishmen were getting more established. We have seen how religious persecution during preceding reigns, at the time of the Reformation, had encouraged private domestic life of families, in the smaller rooms and apart from the gossiping retainer, who might at any time bring destruction upon the household by giving information about items of conversation he had overheard. There is a passage in one of Sir Henry Wootton's letters, written in 1600, which shews that this home life was now becoming a settled characteristic of his countrymen. "Every man's proper mansion house and home, being the theatre of his hospitality, the seate of his selfe fruition, the comfortable part of his own life, the noblest of his son's inheritance, a kind of private princedom, nay the possession thereof an epitome of the whole world, may well deserve by these attributes, according to the degree of the master, to be delightfully adorned." ' UJC Lnni\tl PjliLlii J^" St fi WA LT-Ï4i li-ALiULSJl'S H&litiii. VoL'iill Al,, liïliLftWH. Sir Henry Wootton was ambassador in Venice in 1604, and is said to have been the author of the well-known definition of an ambassador's calling, namely, "an honest man sent abroad to lie for his country's good." This offended the piety of James I., and caused him for some time to be in disgrace. He also published some 20 years later "Elements of Architecture," and being an antiquarian and man of taste, sent home many specimens of the famous Italian wood carving. "In the name of God: Amen. The 2 of January, 1614, I being in Rome compared these desines following, with the Ruines themselves.— INIGO JONES." In the following year he returned from Italy on his appointment as King's surveyor of works, and until his death in 1652 was full of work, though unfortunately for us, much that he designed was never carried out, and much that he carried out has been destroyed by fire. The Banqueting Hall of Whitehall, now Whitehall Chapel; St. Paul's, Covent Garden; the old water gate originally intended as the entrance to the first Duke of Buckingham's Palace, close to Charing Cross; Nos. 55 and 56, on the south side of Great Queen Street, Lincoln's Inn; and one or two monuments and porches, are amongst the examples that remain to us of this great master's work; and of interiors, that of Ashburnham House is left to remind us, with its quiet dignity of style, of this great master. It has been said in speaking of the staircase, plaster ornament, and woodwork of this interior, "upon the whole is set the seal of the time of Charles I." As the work was probably finished during that King's reign, the impression intended to be conveyed was that after wood carving had rather run riot towards the end of the sixteenth century, we had now in the interior designed by Inigo Jones, or influenced by his school, a more quiet and sober style. T'itn KiNfi's Ol-i iwluir., prtftii castlt! The above woodcut shews a portion of the King's room in Ford Castle, which still contains souvenirs of Flodden Field—according to an article in the Magazine of Art. The room is in the northernmost tower, which still preserves externally the stern, grim character of the border fortress; and the room looks towards the famous battle-field. 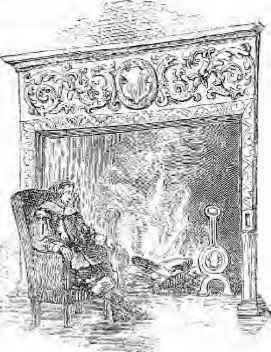 The chair shews a date 1638, and there is another of Dutch design of about fifty or sixty years later; but the carved oak bedstead, with tapestry hangings, and the oak press, which the writer of the article mentions as forming part of the old furniture of the room, scarcely appear in the illustration. Mr. Hungerford Pollen tells us that the majority of so-called Tudor houses were actually built during the reign of James I., and this may probably be accepted as an explanation of the otherwise curious fact of there being much in the architecture and woodwork of this time which would seem to have belonged to the earlier period. The illustrations of wooden chimney-pieces will show this change. There are in the South Kensington Museum some three or four chimney-pieces of stone, having the upper portions of carved oak, the dates of which have been ascertained to be about 1620; these were removed from an old house in Lime Street, City, and give us an idea of the interior decoration of a residence of a London merchant. The one illustrated is somewhat richer than the others, the columns supporting the cornice of the others being almost plain pillars with Ionic or Doric capitals, and the carving of the panels of all of them is in less relief, and simpler in character, than those which occur in the latter part of Elizabeth's time. The earliest dated piece of Jacobean furniture which has come under the writer's observation is the octagonal table belonging to the Carpenters' Company. 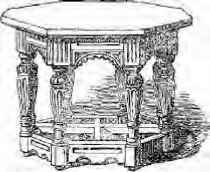 The illustration, taken from Mr. Jupp's book referred to in the last chapter, hardly does the table justice; it is really a very handsome piece of furniture, and measures about 3 feet 3 inches in diameter. In the spandrils of the arches between the legs are the letters R.W., G.I., J.R., and W.W., being the initials of Richard Wyatt, George Isack, John Reeve, and William Willson, who were Master and Wardens of the Company in 1606, which date is carved in two of the spandrils. While the ornamental legs shew some of the characteristics of Elizabethan work, the treatment is less bold, the large acorn-shaped member has become more refined and attenuated, and the ornament is altogether more subdued. This is a remarkable specimen of early Jacobean furniture, and is the only one of the shape and kind known to the writer; it is in excellent preservation, save that the top is split, and it shews signs of having been made with considerable skill and care. 1-rotn Abinsdc-n IJFirlr, Iti tilt J[iil(. Il'mw Ptwtni in the à". Ktnii'\$twi ,Vfrr«J|Jn rilbitni^ HAPIJV XVII, ÇrçKTBBï. The Science and Art Department keep for reference an album containing photographs, not only of many of the specimens in the different museums under its control, but also of some of those which have been lent for a temporary exhibition. 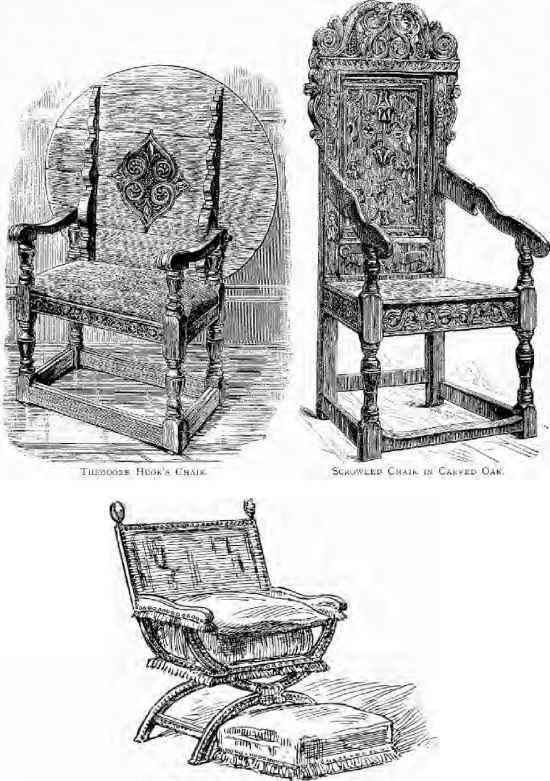 The illustration of the above two chairs is taken from this source, the album having been placed at the writer's disposal by the courtesy of Mr. Jones, of the Photograph Department. 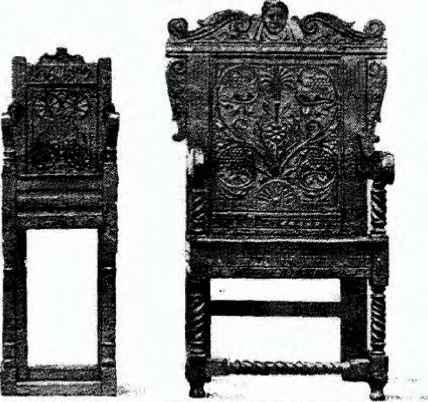 The left-hand chair, from Abingdon Park, is said to have belonged to Lady Barnard, Shakespeare's grand-daughter, and the other may still be seen in the Hall of the Carpenters' Company. In the Hall of the Barbers' Company in Monkswell Street, the Court room, which is lighted with an octagonal cupola, was designed by Inigo Jones as a Theatre of Anatomy, when the Barbers and Surgeons were one corporation. There are some three or four tallies of this period in the Hall, having four legs connected by stretchers, quite plain; the moulded edges of the table tops are also without enrichment. These plain oak slabs, and also the stretchers, have been renewed, but in exactly the same style as the original work; the legs, however, are the old ones, and are simple columns with plain turned capitals and bases. 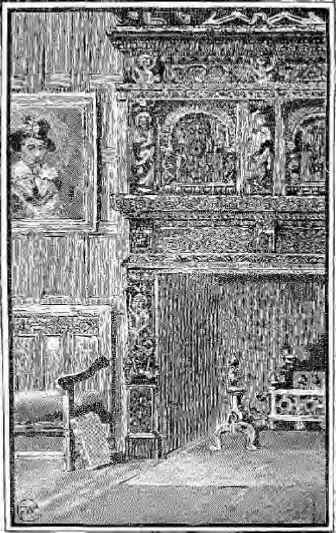 Other tables of this period are to be found in a few old country mansions; there is one in Longleat, which, the writer has been told, has a small drawer at the end, to hold the copper coins with which the retainers of the Marquis of Bath's ancestors used to play a game of shovel penny. In the Chapter House in Westminster Abbey, there is also one of these plain substantial James I. tables, which is singular in being nearly double the width of those which were made at this time. As the Chapter House was, until comparatively recent years, used as a room for the storage of records, this table was probably made, not as a dining table, but for some other purpose requiring greater width. Or.' SiJ'. './ii.i.MHii j\ I3U-; S. KLWirJ-V-rcirv JjitJfiEU.u. r^rriTi : WJF-T-I^-M Iil. In the chapter on Renaissance there was an allusion to Charterhouse, which was purchased for its present purpose by Thomas Sutton in 1611, and in the chapel may be seen to-day the original communion table placed there by the founder. 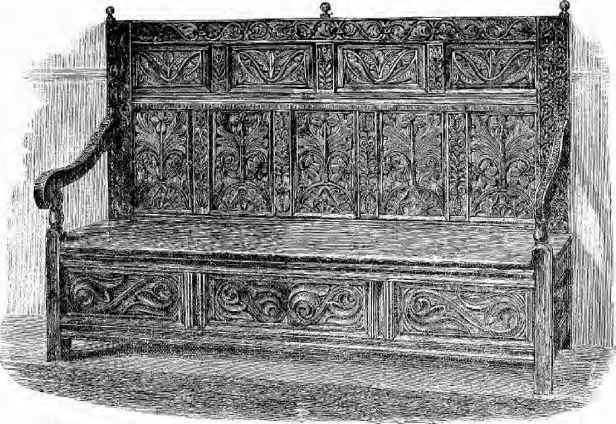 It is of carved oak, with a row of legs running lengthways underneath the middle, and four others at the corners; these, while being cast in the simple lines noticed in the tables in the Barbers' Hall, and the Chapter House, Westminster Abbey, are enriched by carving from the base to the third of the height of the leg, and the frieze of the table is also carved in low relief. The rich carved wood screen which supports the organ loft is also of Jacobean work. There is in the South Kensington Museum a carved oak chest, with a centre panel representing the Adoration of the Magi, about this date, 1615-20; it is mounted on a stand which has three feet in front and two behind, much more primitive and quaint than the ornate supports of Elizabethan carving, while the only ornament on the drawer fronts which form the frieze of the stand are moulded panels, in the centre of each of which is a turned knob by which to open the drawer. This chest and the table which forms its stand were probably not intended for each other. The illustration on the previous page shows the stand, which is a good representation of the carving of this time, i.e., early seventeenth century. The round backed arm chair which the Museum purchased last year from the Hailstone collection, though dated 1614, is really more Elizabethan in design. There is no greater storehouse for specimens of furniture in use during the Jacobean period than Knole, that stately mansion of the Sackville family, then the property of the Earls of Dorset. 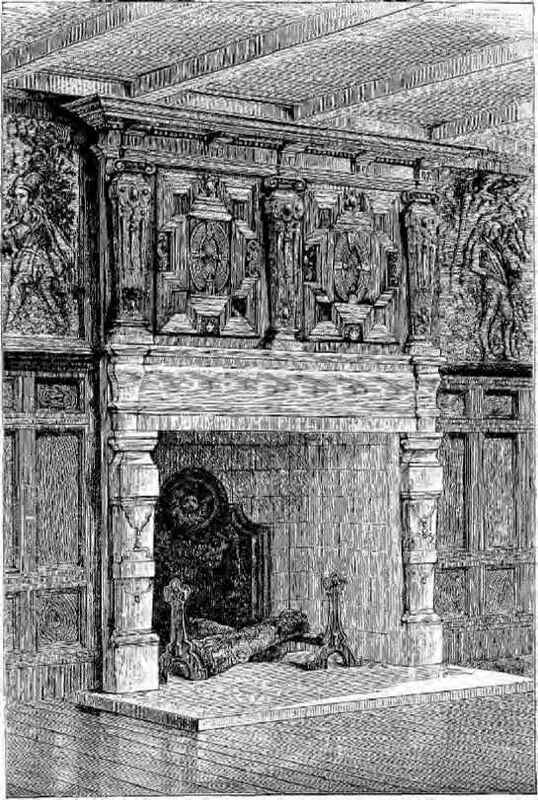 In the King's Bedroom, which is said to have been specially prepared and furnished for the visit of King James I., the public, owing to the courtesy and generous spirit of the present Lord Sackville, can still see the bed, originally of crimson silk, but now faded, elaborately embroidered with gold. It is said to have cost £8,000, and the chairs and seats, which are believed to have formed part of the original equipment of the room, are in much the same position as they then occupied. In the carved work of this furniture we cannot help thinking the hand of the Venetian is to be traced, and it is probable they were either imported or copied from a pattern brought over for the purpose. A suite of furniture of that time appears to have consisted of six stools and two arm chairs, almost entirely covered with velvet, having the X form supports, which, so far as the writer's investigations have gone, appear to have come from Venice. In the "Leicester" gallery at Knole there is a portrait of the King;, painted by Mytens, seated on such a chair, and just below the picture is placed the chair which is said to be identical with the one portrayed. It is similar to the one reproduced on page 100 from a drawing of Mr. Charles Eastlake's. This excellent example of Jacobean furniture has been described and sketched by Mr. Charles Eastlake in "Hints on Household Taste." He says: "The joints are properly 'tenoned' and pinned together in such a manner as to ensure its constant stability. The back is formed like that of a chair, with a horizontal rail only at its upper edge, but it receives additional strength from the second rail, which is introduced at the back of the seat." In Marcus Stone's well-known picture of "The Stolen Keys," this is the sofa portrayed. The arm chair illustrated above is part of the same suite of furniture. The furniture of another room at Knole is said to have been presented by King James to the first Earl of Middlesex, who had married into the Dorset family. 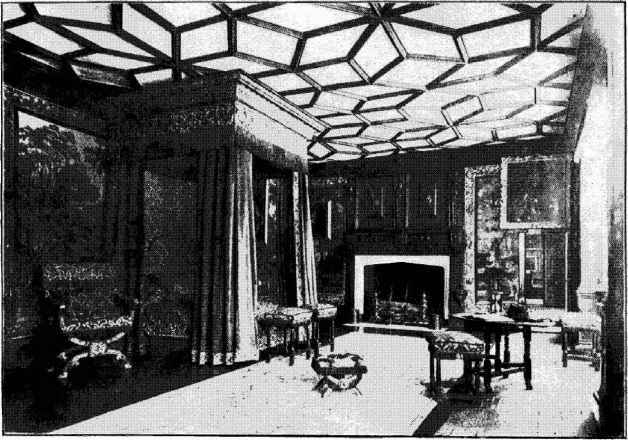 The author has been furnished with a photograph of this room; and the illustration prepared from this will give the reader a better idea than a lengthy description. It seems from the Knole furniture, and a comparison of the designs with those of some of the tables and other woodwork produced during the same reign, bearing the impress of the more severe style of Inigo Jones, that there were then in England two styles of decorative furniture. One of these, simple and severe, showing a reaction from the grotesque freedom of Elizabethan carving, and the other, copied from Venetian ornamental woodwork, with cupids on scrolls forming the supports of stools, having these ornamental legs connected by stretchers the design of which is, in the case of those in the King's Bedchamber at Knole, a couple of cupids in a flying attitude holding up a crown. This kind of furniture was generally gilt, and under the black paint of those at Knole are still to be seen traces of the gold. Mr. Eastlake visited Knole and made careful examination and sketches of the Jacobean furniture there, and has well described and illustrated it in his book just referred to; he mentions that he found a slip of paper tucked beneath the webbing of a settle there, with an inscription in Old English characters which fixed the date of some of the furniture at 1620. In a letter to the writer on this subject, Mr. Lionel Sackville West confirms this date by referring to the heirloom book, which also bears out the writer's opinion that some of the more richly-carved furniture of this time was imported from Italy. In the Lady Chapel of Canterbury Cathedral there is a monument of Dean Boys, who died in 1625. 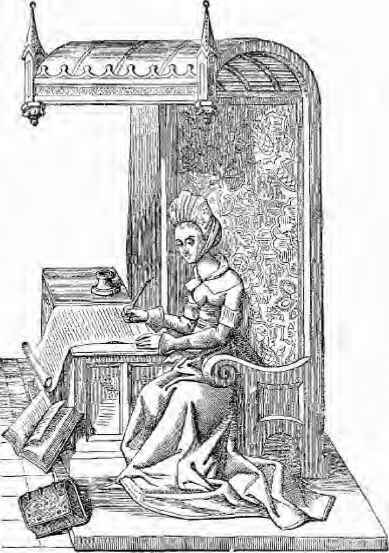 This represents the Dean seated in his library, at a table with turned legs, over which there is a tapestry cover. Books line the walls of the section of the room shown in the stone carving; it differs little from the sanctum of a literary man of the present day. There are many other monuments which represent furniture of this period, and amongst the more curious is that of a child of King James I., in Westminster Abbey, close to the monument of Mary Queen of Scots. The child is sculptured about life size, in a carved cradle of the time. In Holland House, Kensington,9 which is a good example of a Jacobean mansion, there is some oak enrichment of the seventeenth century, and also a garden bench, with its back formed of three shells and the legs shaped and ornamented with scroll work. Horace Walpole mentions this seat, and ascribes the design to Francesco Cleyn, who worked for Charles I. and some of the Court. There is another Jacobean house of considerable interest, the property of Mr. T.G. Jackson, A.R.A. An account of it has been written by him, and was read to some members of the Surrey Archaeological Society, who visited Eagle House, Wimbledon, in 1890. It appears to have been the country seat of a London merchant, who lived early in the seventeenth century. Mr. Jackson bears witness to the excellence of the workmanship, and expresses his opinion that the carved and decorated enrichments were executed by native and not foreign craftsmen. He gives an illustration in his pamphlet of the sunk "Strap Work," which, though Jacobean in its date, is also found in the carved ornament of Elizabeth's time. Another relic of this time is the panel of carved oak in the lych gate of St. Giles', Bloomsbury, dated 1638. This is a realistic representation of "The Resurrection," and when the writer examined it a few weeks ago, it seemed in danger of perishing for lack of a little care and attention. It is very probable that had the reign of Charles I. been less troublous, this would have been a time of much progress in the domestic arts in England. The Queen was of the Medici family, Italian literature was in vogue, and Italian artists therefore would probably have been encouraged to come over and instruct our workmen. The King himself was an excellent mechanic, and boasted that he could earn his living at almost any trade save the making of hangings. His father had established the tapestry works at Mortlake; he himself had bought the Raffaele Cartoons to encourage the work—and much was to be hoped from a monarch who had the judgment to induce a Vandyke to settle in England. The Civil War, whatever it has achieved for our liberty as subjects, certainly hindered by many years our progress as an artistic people. "Come, musicians, play! A hall! a hall! give room and foot it, girls, More light, ye knaves, and turn the tables up." "... The King is weary Of dainty and such picking grievances; And, therefore, will he wipe his tables clean And keep no tell-tale to his memory." Mr. Maskell, in his handbook on "Ivories," tells us that the word "table" was also used in the fourteenth and fifteenth centuries to denote the religious carvings and paintings in churches; and he quotes Chaucer to show that the word was used to describe the game of "draughts." "They dancen and they play at chess and tables." Now, however, at the time of which we are writing, chairs were becoming more plentiful and the table was a definite article of furniture. 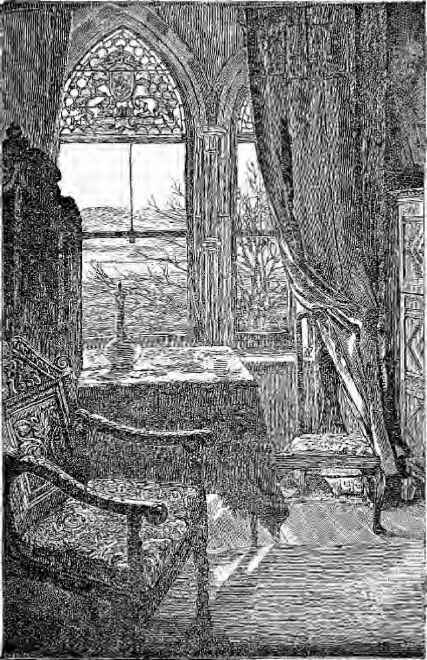 In inventories of the time and for some twenty years previous, as has been already noticed in the preceding chapter, we find mention of "joyned table," framed table, "standing" and "dormant" table, and the word "board" had gradually disappeared, although it remains to us as a souvenir of the past in the name we still give to any body of men meeting for the transaction of business, or in its more social meaning, expressing festivity. The width of these earlier tables had been about 30 inches, and guests sat on one side only, with their backs to the wall, in order, it may be supposed, to be the more ready to resist any sudden raid, which might be made on the house, during the relaxation of the supper hour, and this custom remained long after there was any necessity for its observance. In the time of Charles the First the width was increased, and a contrivance was introduced for doubling the area of the top when required, by two flaps which drew out from either end, and, by means of a wedge-shaped arrangement, the centre or main table top was lowered, and the whole table, thus increased, became level. Illustrations taken from Mr. G.T. 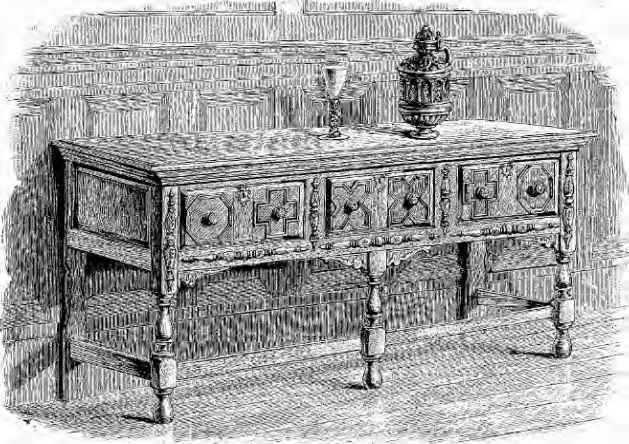 Robinson's article on furniture in the "Art Journal" of 1881, represent a "Drawinge table," which was the name by which these "latest improvements" were known; the black lines were of stained pear tree, let into the oak, and the acorn shaped member of the leg is an imported Dutch design, which became very common about this time, and was applied to the supports of cabinets, sometimes as in the illustration, plainly turned, but frequently carved. Another table of this period was the "folding table," which was made with twelve, sixteen, or with twenty legs, as shewn in the illustration of this example, and which, as its name implies, would shut up into about one third its extended size. There is one of these tables in the Stationers' Hall. In a volume of "Notes and Queries" there is a note which would show that the lady's wardrobe of this time (1622) was a very primitive article of furniture. Mention is made there of a list of articles of wearing apparel belonging to a certain Lady Elizabeth Morgan, sister to Sir Nathaniel Rich, which, according to the old document there quoted, dated the 13th day of November, 1622, "are to be found in a great bar'd chest in my Ladie's Bedchamber." To judge from this list, Lady Morgan was a person of fashion in those days. We may also take it for granted that beyond the bedstead, a prie dieu chair, a bench, some chests, and the indispensable mirror, there was not much else to furnish a lady's bedroom in the reign of James I. or of his successor. COUCH, ARM CHAIR AMD SINGLE CHAMt. O^llolsiertd in rich Silk VsJve;. Part of Soiic at t'jpnshirsl Piati& AI HO An Italian Cabinet, pEKUOi:: Chatlles 11. 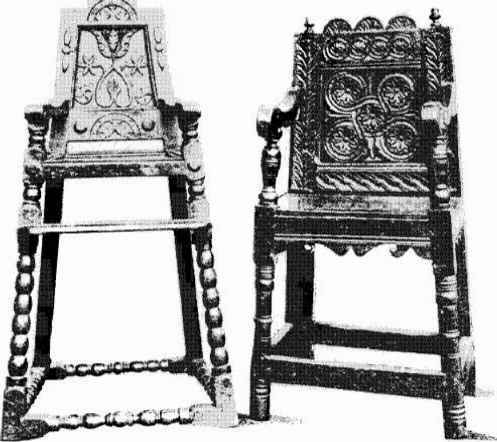 The "long settle" and "scrowled chair" were two other kinds of seats in use from the time of Charles I. to that of James II. The illustrations are taken from authenticated specimens in the collection of Mr. Dalton, of Scarborough. They are most probably of Yorkshire manufacture, about the middle of the seventeenth century. 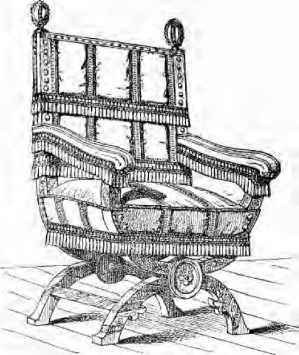 The ornament in the panel of the back of the chair is inlaid work box or ash stained to a greenish black to represent green ebony, with a few small pieces of rich red wood then in great favour; and, says Mr. G. T. Robinson, to whose article mentioned above we are indebted for the description, "probably brought by some buccaneer from the West." Mr. Robinson mentions another chair of the Stuart period, which formed a table, and subsequently became the property of Theodore Hook, who carefully preserved its pedigree. It was purchased by its late owner, Mr. Godwin, editor of "The Builder." A woodcut of this chair is on p. 106. Another chair which played an important part in history is the one in which Charles I. sat during his trial; this was exhibited in the Stuart Exhibition in London in 1889. The illustration is taken from a print in "The Illustrated London News" of the time. 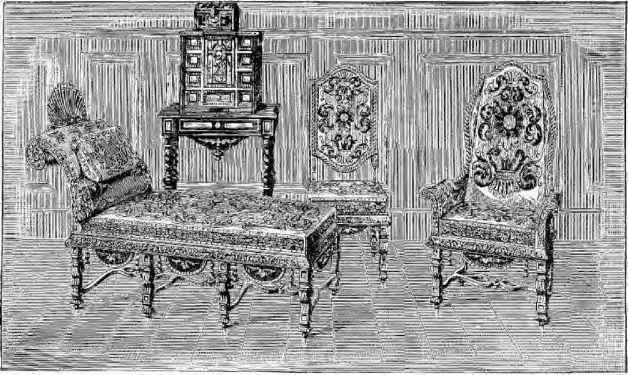 In addition to the chairs of oak, carved, inlaid, and plain, which were in some cases rendered more comfortable by having cushions tied to the backs and seats, the upholstered chair, which we have seen had been brought from Venice in the early part of the reign of James I., now came into general use. 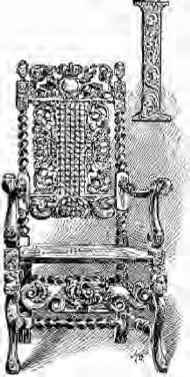 Few appear to have survived, but there are still to be seen in pictures of the period a chair represented as covered with crimson velvet, studded with brass nails, the seat trimmed with fringe, similar to that at Knole, illustrated on p. 100. Inlaid work, which had been crude and rough in the time of Elizabeth, became more in fashion as means increased of decorating both the furniture and the woodwork panelling of the rooms of the Stuart period. Mahogany had been discovered by Raleigh as early as 1595, but did not come into general use until the middle of the eighteenth century. The importation of scarce foreign woods in small quantities gave an impetus to this description of work, which in the marqueterie of Italy, France, Holland, Germany, and Spain, had already made great progress. What an elizabethan lady's bedroom would look like?